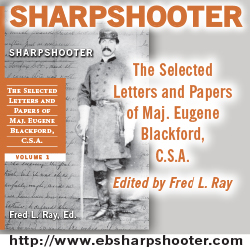 What follows is a map key and map of the present day area east of Richmond along with some features of the Darbytown Road battlefields ans well as areas which are currently for sale, areas Charles believes would work for a new Battlefield Park, and his Grandfather’s Farm. Be sure to keep an eye out here for details on how to help Charles preserve these battlefields before they are lost forever. 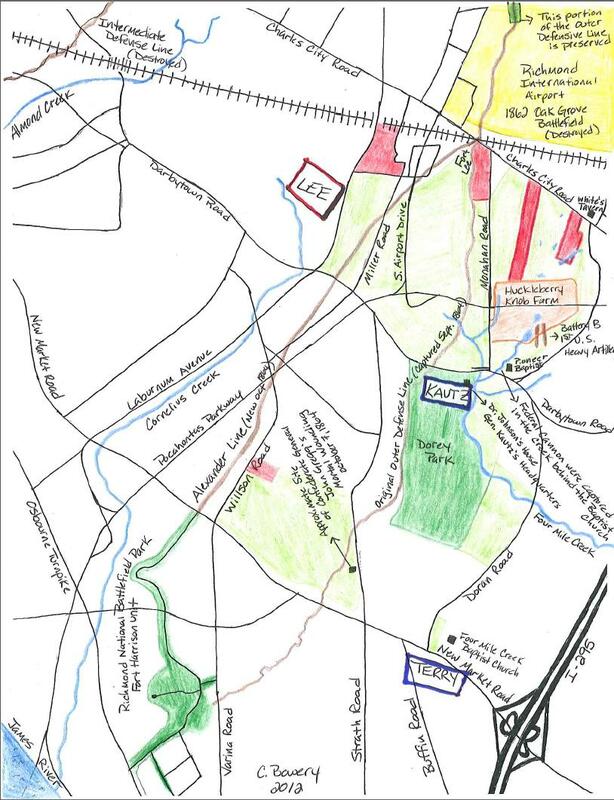 Attached is a hand drawn map of the Darbytown Road battlefield. It includes more land area than what is generally considered as the battlefield, but provides some idea as to its location for those familiar with the Richmond area. I did not place a compass on the map, but the Airport (shaded in yellow) is north. You will notice on the map that there is a black line to the left of the intersection of Monahan and Darbytown Roads and slightly above Darbytown Road. That small black line indicates the only remaining section of the original Darbytown Road on the battlefield. The general boundary of the battlefield (for all three battles) is Laburnum Avenue to the west, the end of the page on the right (east), Charles City Road to the north and New Market Road to the south. White sections within that boundary have been lost to development or are slated to be developed. The battlefield area for the October 27th Battle of Fair Oaks and Darbytown Road exceeds the area depicted on this map. The Fair Oaks section of the battlefield extended northward from Charles City Road and over Williamsburg and Nine Mile Roads. That area has been completely obliterated by development. The white area surrounding the battlefield shows how it is being squeezed by development. Notice the tiny sliver of light green just north of “TERRY.” Without question, by the end of this decade, if not before then, the remainder of the battlefield will be developed or purchased by developers to hold for future development. Light Green: Sections of the battlefield that can be preserved as a park. There are houses in this area, but they “hug” the streets. There is no development along the Pocahontas Parkway or South Airport Drive south of where the Alexander Line is indicated. Red: The red colored sections are parcels currently for sale. Orange: My grandfather’s farm. Though it is not shaded in light green, the only development through the farm is the Pocahontas Parkway. The remainder of the farm is forest with two open fields along Monahan Road. To provide some idea as to scale, the farm is over 100 acres. Previous post: Did Lee Tell Ewell To Halt on July 1 at Gettysburg?